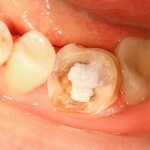 The use of cavity liners following the removal of dentine has been recommended for decades. They are considered to protect the pulp, induce development of reactionary dentine, encourage remineralisation and reduce bacterial numbers. The aim of this review was to assess the antibacterial effects of cavity liners. The Medline, Embase, Cochrane Central Register of Controlled Trials and Opengrey (www.opengrey.eu) databases were searched for randomised and non-randomised trials. Two reviewers independently extracted data and study quality was assessed using the Cochrane risk of bias approach. Studies reporting changes in bacterial load with difference cavity treatments were considered. The primary outcome was the number of positive bacterial dentine samples remaining in a cavity, i.e. the proportion of cavities with cultivable bacteria, estimated as odds ratio (OR). The secondary outcome was the reduction in the numbers of bacteria remaining in the cavity, with colony forming units as effect measure, calculated as standardized mean differences (SMD). 14 studies (11 RCTs) involving the treatment of 500 lesions were included. 7 studies included a placebo group with no liner. Glass ionomer cement in three studies (55 teeth). Both black copper cement and mineral trioxide each were used in one study (15 and 10 teeth, respectively). Network meta-analysis (11 studies) found mineral trioxide lining to yield the greatest probability of achieving sterile cavities after a lining/sealing period (73%), followed by antibiotic/disinfectant (8%) and zinc oxide eugenol (7%). 6 studies assessed bacterial reduction after lining/sealing, and zinc oxide eugenol was found to have the highest probability of achieving a bacterial reduction. Within the limitations of this review and the included studies, certain liners seem more suitable to achieve sterile cavities or reduce bacterial numbers than others. Given the paucity of data and the unclear impact of remaining bacteria on clinical outcomes, further recommendations for specific cavity treatments prior a restoration are not possible. The authors have searched 3 major databases and the grey literature and followed a sound methodological approach for this review. However, although cavity lining has been advocated for decades this review highlights the limited number of studies available to address one reason for their use, namely a reduction in bacterial load within a cavity. Schwendicke F, Tu YK, Hsu LY, Göstemeyer G. Antibacterial effects of cavity lining: A systematic review and network meta-analysis. J Dent. 2015 Jul 6. pii: S0300-5712(15)30008-7. doi: 10.1016/j.jdent.2015.07.001. [Epub ahead of print] Review. PubMed PMID: 26159385. Antibacterial effects of cavity lining: limited evidence available. Don’t miss – Antibacterial effects of cavity lining: limited evidence available.